rebecca likes nails: oh my GOSH birthday giveaway winner!! Hi guys! I'm posting this a bit later than I planned - but I didn't forget! I ended up having such a great birthday that I had no time to actually get this posted before my birthday ended! I got so many birthday wishes from all of you guys, and I couldn't be more thankful! All of you have made my birthday so special. So, I had my great day, now someone else is about to have a great day too! 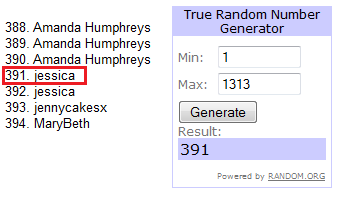 There were 606 individual entries in the giveaway, with second and third entries bringing the total up to... Get this... 1313. What did I tell you about lucky 13?! Jessica has replied to my email and so she has officially won! Thanks again everyone! I love and appreciate all of you! Have a lovely day! OMG i didnt even realize!!!! Wow!!! 13 is soooooo lucky! I might have to change my lucky number to 13 now. lol :P Congrats jessica! You just got the awesomest gosh polish in the world!! I am so jealous! O_o idk if I won or if it was a different Jessica?!?! Yup, 13 indeed is so lucky!